Trichophyton rubrum is a fungus (dermatophytic fungus). It belongs to phylum ascomycota of class Euascomycetes. It exclusively colonize in upper most layer of dead skin cells. Trichophyton is responsible for causing athlete foot, nail fungal infection, ring worm appearance and jock itch. Trichophyton rubrum consists of complex of species i.e. morphotypes which are geographically patterned. Mostly of them are described as distinct taxa. like T. Megninii, T. Raubitschekii, T. Soudanence, T. Gourvilii. It is the common cause of dermatophytosis all over the World. Dermatophytosis occurs on skin of feet, and between finger nails. This fungal disease appear in various colors. Trichophyton rubrum causes fungal infection named dermatophytosis. It occurs on the skin of feet and in between finger nails. It may appear in different shades like white, brown, yellow and red. It also have different texture like it may be waxy, smooth or cottony in texture. Dermatophytosis can be observed easily but its accurate diagnosis is very difficult because of its appearance. Trichophyton rubrum can cause athlete foot, ring worm, jock itch and nail fungal infection. So all these conditions show different symptoms according to their texture, site of infection and color of appearance. Trichophyton rubrum is the main and only cause of dermatophytosis. It is not a life threatening infection. The pathogen i.e. trichophyton rubrum have the ability to secrete and produce proteolytic enzymes which are proved more virulent. Trichophyton rubrum enters in to skin via degrading the keratin of skin. Keratin is a fibrous protein present mainly in skin. Trichophyton rubrum invades through stratum corneum which is the skin outer most layer of epidermis. As a result, dermatophysis occurs in the form of athlete foot, jock itch, fungal infection between fingers and finger nails. It is a painful disease. Trichophyton rubrum causes skin fungal infection. It occurs on foot basically so treatment is selected on the basis of severity. Topical medications are used which involve anti fungal agents like miconazole nitrate, clotrimazole, terbinafine hydrochloride, tolnaftate, undecylenic acid and butenafine hydrochloride. 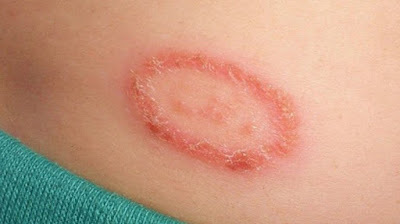 Ketoconazole is highly recommended in oral dosage form for severe skin disease. Long term use of ketoconazole in oral dosage form is not recommended because it can harm liver due to its 1st pass effect. Photodynamic treatment, laser treatment, activation of rose bengal dye with light specially by green laser light. Fingernail infection will take about 6 to 8 weeks to fully recover. Trichophyton rubrum causes skin infection named dermatophytosis. This pathogen can survive in in-vitro conditions i.e. outside the body. Outside the body it exists in the form of a spore. Trichophyton rubrum lets spores desquamate and this is the reason it remains over full in most of the human habitat. This pathogen shows growth in moist conditions that's why it readily grows on skin surface. With moisture, warm conditions are also necessary. It spread with normal flora on stratum corneum of epidermal layer which is the upper most layer of skin.